Just as the month of December instantly triggers the thoughts of Christmas, the month of July is intimately linked in the Ashram with the celebration of the Ashadi Ekadashi and the Guru Poornima Festivals. It is a mega event that triggers the first big celebration of the new academic year, when the students have just returned after the summer holidays and Bhagavan Himself has also come back after His summer sojourn in Kodaikanal and Brindavan. It is the devotees from the States of Maharashtra and Goa that kick-start this event with the two-day long celebration of the Ashadi Ekadashi festival by hundreds of Bala Vikas children from these States. We bring you a report of the two dramas staged by these children as well as the rich musical fare offered by talented musicians from Maharashtra. 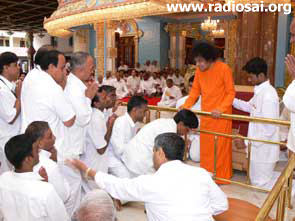 Bhumi puja (consecrating the ground before construction), for the proposed indoor stadium of the Sri Sathya Sai Institute of Higher Learning, was also done on this auspicious day. 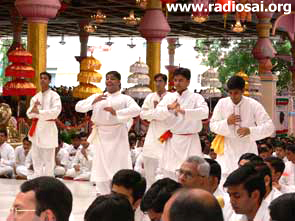 Close on the heels of the Ashadi Ekadashi festival comes the Guru Poornima celebrations. Traditionally the students sing stothrams to Bhagavan, their Sadguru in the morning on this holy day. Tricycles were also distributed to a few handicapped villagers during the morning. 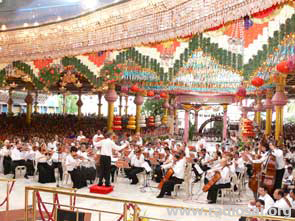 The evening of Guru Poornima day saw the Sai Symphony Orchestra regale the crowd. This year we saw, in addition to this international orchestra, the Bala Vikas children from Indonesia and Canada present dramas in the Divine Presence. We bring you a report of these as well as other programmes that were celebrated this month. Ashadi Ekadashi is a religious procession and is celebrated during the months of June - July (Aashaadh Shukla paksha). 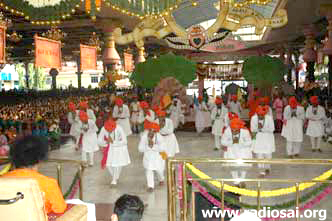 It consists of a procession in which people collectively go singing and dancing the glory of the Lord in what are called as ‘Dindis’. 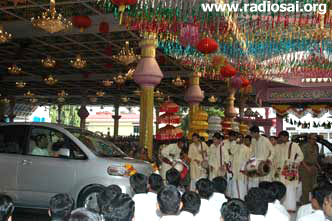 This custom of taking out a holy procession is said to have started as far back as the year 1810. Tradition has it that two of the greatest devotees of the Lord from the State of Maharashtra, Sant Gyaneshwar and Sant Tukaram had set out on a pilgrimage to the temple of Lord Vittala from their respective places and reached the Divine Abode in fifteen days time on the auspicious day of Ashadi Ekadashi. Vithal, or Vitthal, or Vithoba, or Pandurang (a form of Krishna ) is worshipped in some temples in Kerala. 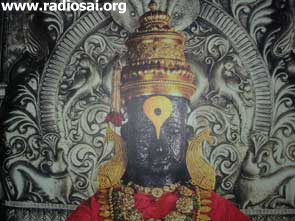 Vitthala's original temple is at Pandharpur, Maharashtra. Pandharpur is located 65 km West of Sholapur, on the banks of the river Bhimarathi also known as Chandrabhaga . Vitthala is said to have been derived from the word Vishnu in Kannada. 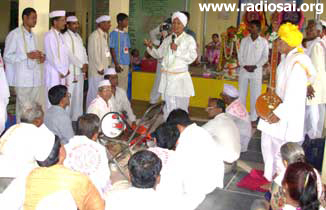 Panduranga is a Sanskritized form of Pandarga, the old name of Pandharpur. Following this tradition established by these great souls centuries ago, even today devotees from the entire length and breadth of the state of Maharashtra and even from outside the state set out for Pandharpur, to the famous temple of Lord Vittala, wearing basil beads and singing His glory on a pilgrimage scheduled so that they reach Pandarpur on the auspicious day of Ashadi Ekadashi to have His Divine Darshan. 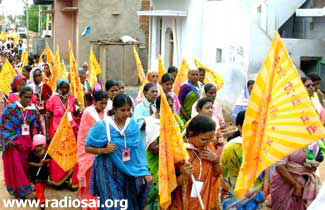 This pilgrimage is traditionally called the Dindi Yatra. 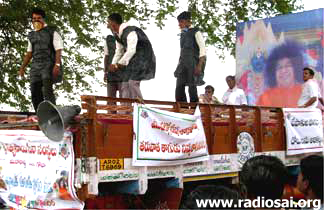 A similar (yatra) procession is being carried out by the devotees of Sri Sathya Sai Baba by carrying a palanquin with the Paduka (sandals) of our beloved Sai from Dharmavaram to reach Prashanti Nilayam (Puttaparthi) (a distance of about 35 kilometres) on the day of Ashadi Ekadasi. 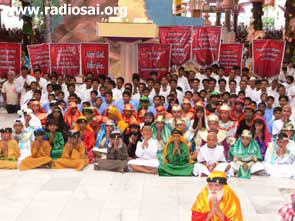 This journey is performed as a sadhana by the warkaris (as the devotees of Lord Vittala are called) by singing the name of Sai Vittala together with rendering of Dindi Seva – wherein the people on pilgrimage undertake selfless service to the poor and needy en route - like annadhanam (donation of food-grains), medical seva, building & repairing rural infrastructure, etc. 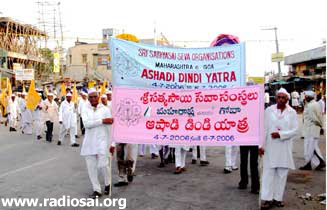 Participation in the Ashadi Dindi Yatra and Dindi Seva helps an individual in many ways by bringing good health, peace & prosperity in his life. By continuously chanting the glory of the God in the Ashadi Dindi procession and by performing the Dindi Seva, an inner cleansing takes place in Mind, Body and Spirit and the participants experience immeasurable bliss. It is believed that this holy pilgrimage removes all the sins committed knowingly or unknowingly and helps in one’s spiritual progress. 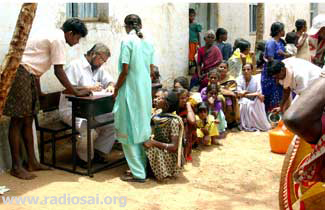 Dindi Seva or selfless service to the poor encompasses activities like distribution of foodgrains (annadhanam), improving rural infrastructure and medical camps. Amruta Kalash is a bundle of love; it is Bhagavan’s prasadam in the form of nine essential grocery items required for cooking meals for 5 days for a family. 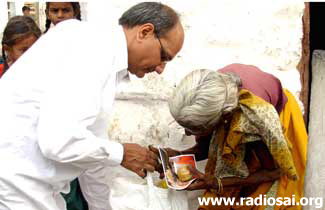 About 1008 kalash packets were distributed to the most backward families enroute to Prashanti Nilayam. In terms of poverty, Anantapur district is one of the poorest districts in India. The economy is principally agrarian with very few industries. With very little rainfall this district is one of the most backward provinces in the state and chronically drought prone. Infant mortality rate is 70 per 1,000 births in the district as against the State average of 59. Monthly per capita rural consumption is Rs.400 per month (one of the lowest in the state). It is frequently in the news for farmers’ deaths through suicides due to acute financial problems, has a high incidence of brain fever and also low agriculture productivity. Distribution of Amruta Kalash is a small symbolic act expressing solidarity with the people and spreading Swami’s message of love and care and assuring the people that our Bhagavan is there to take care of all. As part of Dindi seva some work is undertaken in terms of improving village infrastructure in a small way. This year two toilets were constructed for the use of the children of the Medapuram High school - one for the girls and the other for the boys. Besides these 9 ceiling fans and tube lights were installed in the class rooms. 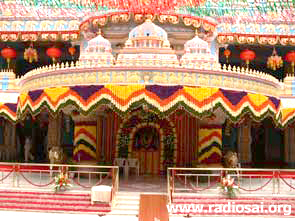 A few tube lights were installed in the Basampalli temple for the use of the villagers. 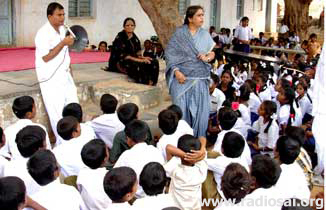 In addition, a project to educate the village on the awareness of healthy living was undertaken. 3 tableaux were made on the themes of National Integration, the ill effects of the consumption of tobacco & liquor, health and hygiene. 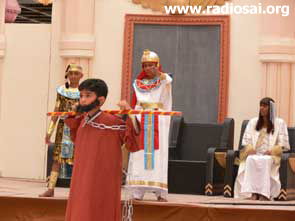 These tableaux visited all the nearby villages and spread the awareness on the themes mentioned above. 27 Youth from Navi Mumbai and Thane district staged plays in Telugu in the village square to convey important spiritual messages. 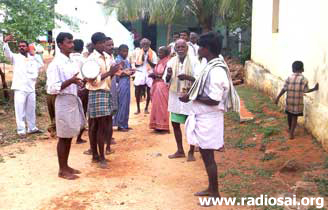 All the villagers lent a patient hearing and understood the importance of the themes presented. In Anantapur district health spending is amongst the fastest growing components of rural family debt. Public hospitals are starved of funds, medicines and drugs. Lack of adequate primary health centres leads to last stage diagnosis of serious health problems. Poor agriculture output, coupled with rising inflation leaves little savings for other needs. The net result is a lack of money for heath needs resulting in a vicious cycle of poverty and ill health. Anantapur district also has acute Fluorosis related problems (a disease caused due to excessive fluoride levels in the ground water). 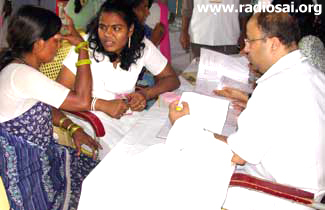 Early diagnosis through public medical camps, timely treatment and medicine for the lesser problems before it becomes grave and an awareness campaign for preventive care and hygiene could reduce the impact of the vicious cycle, even if it cannot completely break it. The annual Dindi medical seva is thus an offering at His lotus feet to supplement in a small way the initiatives taken by Bhagavan in rural health care. The objectives of the camps are “Early diagnosis and damage control” with the focus being the children of these communities. 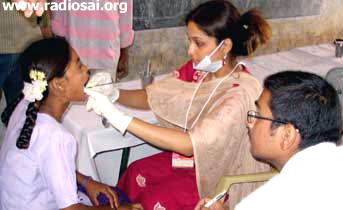 The areas of specialization included General Pediatric, Heart ailments, Congenital abnormalities or Primary complex, Dental check up and timely help for treatable problems, Eye check up for errors of refraction or other problems, a Skin specialist check up to rule out Leprosy and an ENT check up. The camps catered to 1495 children and about 2500 adults, who were treated in 3 different camps all through the seva period. The Camps were organized for 3 days in 4 village cluster centers. Spectacles were made and delivered after 2/3 days. Children with heart, eye and neurological problems were referred to the nearest hospitals. 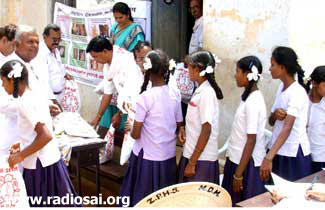 Health education & Fluorosis awareness was done through a poster exhibition. Bala Vikas Classes were held in the various villages and in addition Bal Amrut Kalash containing Sai Protein and Health biscuits, Peanut chikki, Iron Tonic/Multivitamin tablets, Health education booklet /Toy, anti-worm tablets, Toothbrush, Toothpaste, comb, towel, and soap were also distributed to the children. Free lunch was served to all who visited the medical camp. In all about 20 specialists and 15 general physicians and many pharmacists and sevadals participated in the medical camp. 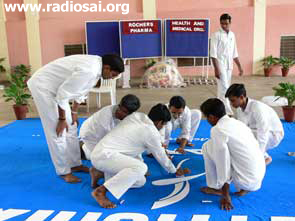 The students from the Anantapur Medical College also assisted the team of doctors in the above mission. A veterinary camp was also organized during the above days. A total of 280 animals were treated and medicines prescribed. 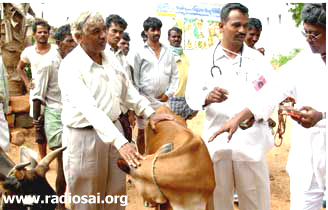 The doctors explained the need to take care of the health of the animals to the villagers. Heart2Heart would like to gratefully acknowledge the receipt of the text and photographs on the Dindi Yatra and Dindi Seva which were provided to us by the State President, Sri Sathya Sai Seva Organization of Maharashtra. 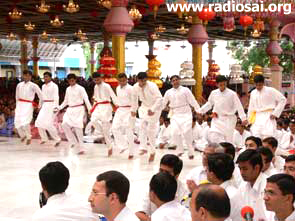 The morning of Ashadi Ekadashi was greeted by an elegantly decorated Sai Kulwant hall. 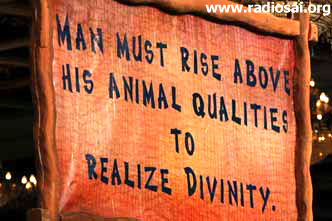 The entire Hall was decorated by pithy sayings like MAN IS DIVINE and MAN MUST RISE ABOVE HIS ANIMAL QUALITIES. 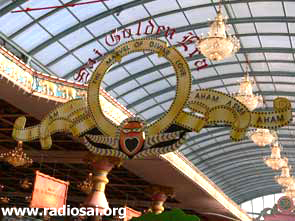 From the ceiling suspended by ropes hung a ‘logo’ (modelled on the lines of the famous MGM symbol through which the lion roars at the opening scene of every MGM movie) which proclaimed the SAI GOLDEN ERA, THE MARVEL OF DIVINE LOVE. We were wondering about this unique contraption and its significance but it became clear only later in the morning when the Lion King in the children’s drama roared through the opening to proclaim AHAM ASMI – I AM I after the “logo” was lowered during the drama in a dramatic scene. There was also an intriguing back-drop (situated behind Swami’s chair) that merits some explanation. At the centre was Lord Vittala (an avatar of Lord Vishnu) and He had a halo behind the head of the sarva dharma symbol with the 5 petals showing the 5 human values of Love, Non-Violence, Truth, Right Conduct and Peace. Thus cleverly Lord Vittala was linked to Swami to show that “They are One”. 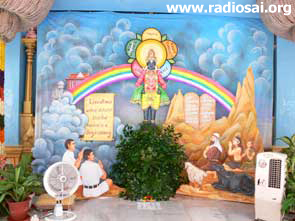 Furthermore on one side was Moses, the founder of Judaism, and the other side was a depiction of Swami’s students and Lord Vittala is shown balancing both. Thus they wanted to show that it was Swami Himself who had given Moses the Ten Commandments in the aeons past as guiding principles for humanity and now in this present age, Swami has given the human values as guidelines for youngsters and humanity at large. The mountain and the popular depiction of the stone slabs containing the Ten Commandments as given by God to Moses are also shown. On the other side the sky shows a message representing one of Swami’s immortal teachings depicted as a scroll, LOVE ALL MEN WITHOUT DISTINCTION. KNOW THAT MANKIND IS A SINGLE COMMUNITY. A rainbow bridges the gap between both the eras. A discerning viewer can even make out faint outlines of the Chaitanya Jyothi and the Museum just behind the rainbow. A meaningful and strong back-drop well befitting the occasion! 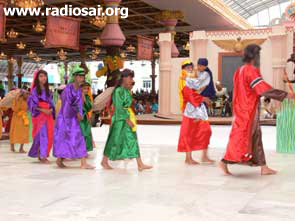 Swami was escorted into Sai Kulwant Hall by a group of children dressed as warkaris, devotees of Sai Vittala. Four men, also appropriately dressed, blew conch shells in the traditional welcome ceremony from ages past as Swami’s car passed by. 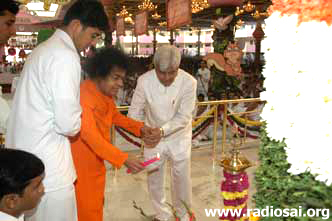 After Swami reached the stage and had given His benedictory darshan to the assembled multitude, He graciously lit the lamp to signify the start of the two day ceremony. 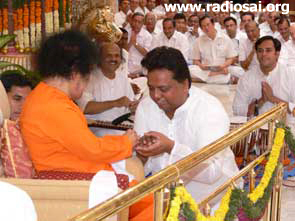 After Swami was seated He was first welcomed with a rose by Sri Ramesh Sawant, President of the Maharashtra State Sathya Sai Seva Organisations. Following this a number of the State Officials also welcomed Him in turn either with a rose or a plate of fruits. As part of the birthday celebrations in Maharashtra last year, they had organised an evening of enchanting divine music inviting some of the top musicians from Mumbai and other parts of India. 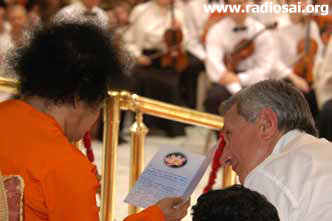 A DVD of this musical extravaganza was also presented to Swami who blessed it. The first item on the agenda was the warkaris to end their dindi yatra, the 400 devotees who had walked with the sandals of the Lord from Dharmavaram; who made a dramatic entrance carrying the palanquin with the sandals of the Lord. 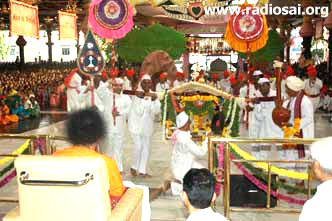 They came in to the strains of the Dindi song celebrating the glory of the Sathya Sai Avatar and also paying obeisance to the great saints of Maharashtra like Nivrutti, Gnanadev, Eknath and Tukaram who have blessed everyone gathered there that day. This was the culmination of their Dindi Yatra from Dharmavaram; and it was completely fulfilled by having the darshan of Sai Vittala on Ashadi Ekadashi Day. 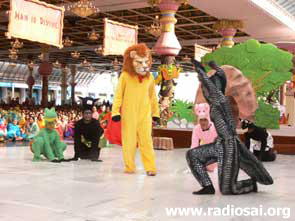 This was followed by a musical entitled "The Divine Commandment", with the cast comprising of 150 children (95 boys and 65 girls) of the Sri Sathya Sai Bal Vikas, Mumbai, Maharashtra and about 150 participants (50 boys and 100 girls) belonging to the youth wing. All the State officials heaved a sigh of relief when the drama started as the days preceding were filled with tension and high drama. It had started raining heavily in Mumbai before the children were to leave by train to Puttaparthi. There was a lot of anxiety if the train would be allowed to leave Mumbai station at all. But leave it did, and was perhaps one of the last trains to leave Mumbai, before the train service was shut down due to inundation of the railway lines. Swami assured the office bearers not to worry and that they could have the programme after the children arrived. 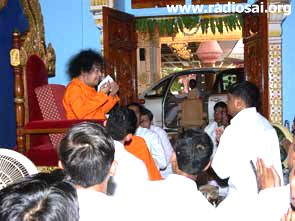 The train in which they were travelling had to proceed very slowly as the tracks were under water at many places, but with Swami’s grace they all arrived safely and in time for the programme to be held as scheduled on the morning of July 7th. 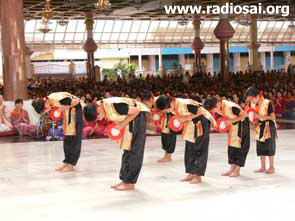 The Ashadi Ekadashi drama is a popular fixture in the Prashanti Nilayam calendar and people look forward to it all year. And this year was no exception. 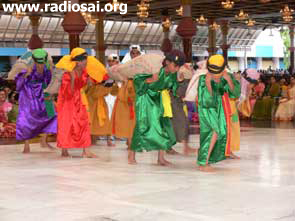 The Ashadi Ekadashi dramas are characterised by a clever and novel theme, colourful costumes, catchy tunes and well choreographed dances all calculated to drive home one or two of Swami’s selected teachings for that year. In the saga of the amelioration of Man, similes of animals have often been used to describe his negative qualities. However the state of Man today is such that even the animals have taken umbrage to these similes. The labelling of a deceitful liar as – “as cunning as a fox”, the description of a hypocrite as shedding crocodile tears, a silly and narrow-minded person being referred to as a frog in a well, associating the bull with anger and the pig with greed and referring to a treacherous person as a snake in the grass and the humorous complaint of the duck that when a man is out for a zero in the game of cricket he is supposed to have scored a duck, all raise the ire of the Lion King who commands that Man be brought before him for judgement. The Conference of Animals convened by the Lion King has unanimously decried the overtures of Man and have put forth their case that the animals are followers of Human Values and it is they who have successfully maintained the balance of Nature, while Man survives on exploitation of other creations. Man is captured and brought before the king. The Lion king gives man a chance to defend himself, but man is shown to be weaker than the animals - slower of foot, conniving and harmful to even the members of his own species. Even the horse complains that man has dragged him to fight his numerous wars, and man’s best friend the dog also turns against him. Man tries to boast of his technological accomplishments but the elephant asks him if he has conquered his own petty mind (The elephant’s song making the point that “without adherence to dharma man is just an animal” was very poignant). The tiger mocks man for not following dharma but living a life of vice, where desires only increase but man has no peace. All the animals thus proclaim in turn that they have a reason and season for everything they do, but Man has none. Man then uses his clinching argument by stating that only he has the power to know God. The animals reply that man today has forgotten God but the animals still remember Him, for serving the Lord is the motto of all the subjects in the Lion King’s kingdom. 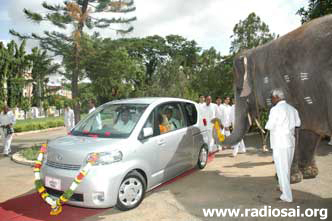 For it is not only man but even animals have been the chosen instruments of the Lord, for rendering yeomen service in the form of the different vahanas (divine vehicles of transportation). At this juncture there was the Medley of Vahanas song where different colourful vahanas – like the Hamsa vahana (Swan), the Nandi vahana (Bull), the Garuda vahana (eagle), the Simha vahana (the Lion), the mayur vahana (peacock), the mushaka vahana (rat) and so on - strutted across the stage to some meaningful Sanskrit slokas being chanted in the back-ground. 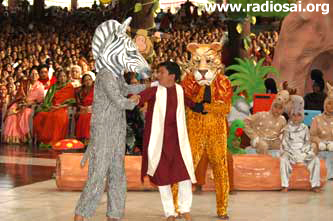 Going further, in the drama the animals also assert that God assumed the animal form in several Avatars to reiterate the fact that animals are also children of God and that we all belong to the Kingdom of God. The Song of Avatars then plays with appropriate slokas while the Avatars’ form of the fish, the boar and the half-lion and so on, all gracefully stride across the stage. 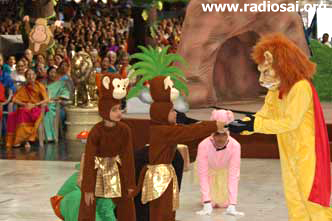 The Lion King then proclaims that the animals are supreme. The animals cheer and man hangs his head down in shame. 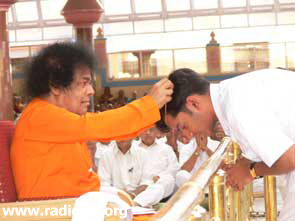 The wise elephant, however, extols that Man is indeed a reflection of God, and that Man seems to have forgotten this Divine Commandment "I AM I - AHAM ASMI" and the Lord God Bhagavan Sri Sathya Sai Baba is here to remind him of the same and to redeem Man from the illusion of Maya. At this point the sage Narada enters and pointing to the pig (who is really Indra) asks if he is ready to enter back to Indraloka. (This was referring to a popular story often related by Swami to show the powerful influence of maya where Lord Indra becomes a pig and thinks he is in “hog heaven” in company with his piggy wife and piglets as children, forgetting his own divine heritage). Narada’s song then asks man to shed Desire, Anger, Greed and Attachment and see the Divine Atma. The wise elephant avers that the spiritual regeneration of mankind can only happen through the divine programme of Sri Sathya Sai Bal Vikas given to us by our dear Bhagavan. 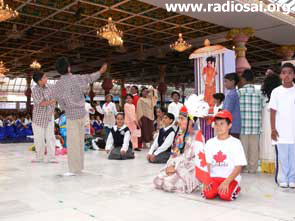 This programme awakens man to his reality by touching and transforming the lives of children, parents and gurus. A contemporary class is then shown where the students are taught inane nursery rhymes like Baa Baa Black Sheep. This is followed by a Bala Vikas class where the children learn that God really resides in all of them. 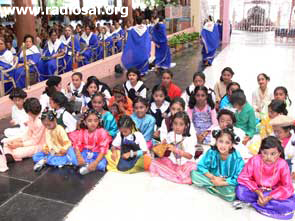 The School Song (“Sai Baba Who are you; Yes Dear I am You”) is then sung and the musical culminates with all the animals joining the Bal Vikas children in their class, contemplating on their real nature. By the divine grace of our Bhagavan, not only humans but even the animals can realize that we all belong to the Kingdom of God. The musical was a huge success and was greeted with prolonged clapping. 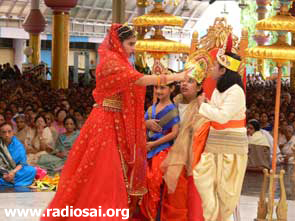 Swami sent clothes and other goodies for distribution as a sign of His pleasure. But Swami was not yet done for the day. 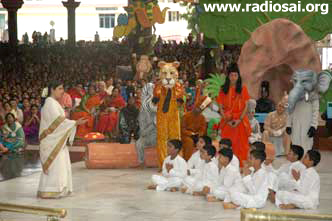 There was still an important event to take place, an event that He had been referring to often when he was in Brindavan during the Summer – the “Bhumi Puja” or the ground consecration ceremony before the start of the construction of the new Sri Sathya Sai Centre for Sports or what is informally being referred to as the “Indoor Stadium”. To commemorate 25 years of the Institute, Bhagavan Sri Sathya Sai Baba, as the Chancellor of the Institute has graciously gifted the students with an indoor sports complex that will meet Olympic standards. The Sports complex, when it is built, will be spread over 4.6 acres and has a spacious 58 metres x 98 metres multi-sport hall with elliptical galleries on all sides and will offer six disciplines – badminton, basketball, table-tennis, squash, volleyball and gymnastics. The complex will have an octagonal display centre with a diameter of 60 feet. 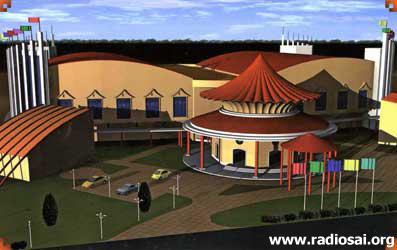 The stadium hall will hold a capacity of 4000 people and the building will have 6 entrances. The facility will also offer a 400 metre 8 lane outdoor running track, two outdoor tennis courts, a Yoga Centre and a Hall for Aerobics. 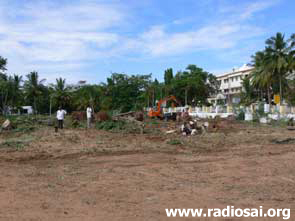 Unfortunately a number of trees that had graced these grounds had to be levelled to make way for the new Centre for Sports. Sai Gita also had her home within the confines of these grounds and a new residence had to be built for her. 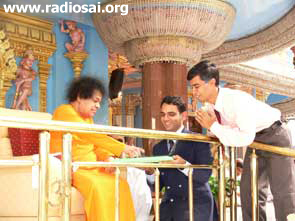 Swami had earlier, on July 1st, made a visit to the Planetarium for the express purpose of picking a site for Sai Gita’s new residence. So after the morning’s Ashadi Ekadashi celebration was over, and after the prasadam was distributed, Swami came to the Planetarium to first do the Bhumi Puja for Sai Gita’s new residence. 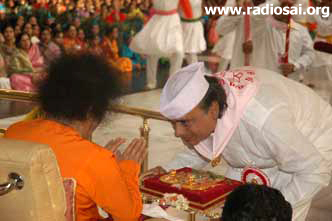 Swami was welcomed by a well bedecked Sai Gita who welcomed Her Lord and Master with a squeal and a garland in her trunk. 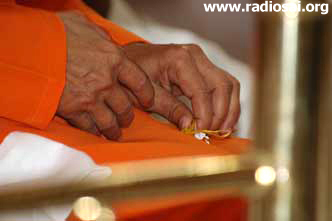 Swami stayed for a few minutes and blessed the stones that would be used in the construction. He also asked some elders to break a few coconuts and made other offerings as a sign of auspiciousness, while the students of the Institute chanted the Vedas. 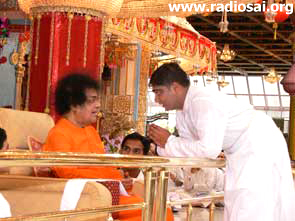 After blessing the construction of Sai Gita’s new home, Swami’s car went next door where a huge tent had been erected with a gathering of press, construction workers, interested well-wishers and students for the Bhumi Puja of the Indoor Stadium. The same ritual was again repeated albeit on a bigger scale, and we not only had auspicious offerings of rice, flower petals and other precious and auspicious items as a part of the Bhumi Puja, but elders like the Vice-Chancellor, Ashram Officials and long-term devotees like Sri Audikesavulu, Dr Narendra Reddy, and Sri Balaram also broke coconuts to render the ground sacred and invoke the blessings of the Gods for the safe, efficient and speedy construction of this mammoth edifice. 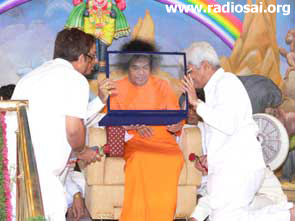 After Swami had sat on the dais, He asked for bhajans to be sung. 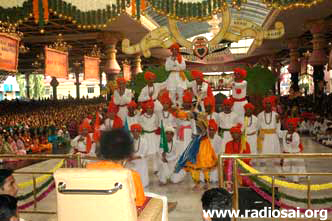 The bhajan troupe from Maharashtra sang 5 bhajans – Jaya Gabaraya Sri Ganaraya, Sadguru Sai Saraswati, Jaya Sai Narayan Keshava, Nanda Nandan Hari Govind Gopal, and Chandravadana Kamalanayana before Swami asked the evening’s main programme, a drama called The Ten Commandments, to begin. 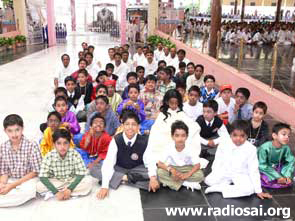 The evening programme was presented by the Sri Sathya Sai Bal Vikas children of Buldhana district of Maharashtra comprising of 67 boys and about 21girls. Long long ago, the Hebrews came to Egypt, fertile with the magnificent river Nile, in search of food during a famine which affected the ancient near East. At first, they were welcomed but after about four hundred years, the Hebrews were perceived as a threat and were enslaved. Yet, there was a ray of hope. The Hebrews believed that a Deliverer, a Messenger of God would come, set them free and lead them to the Promised Land. The Deliverer, the Messenger of God who came to set free the Hebrews and lead them to the Promised Land was none other than Moses. 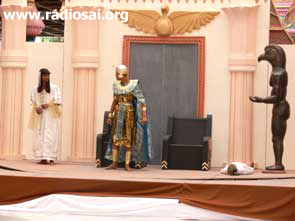 The drama opens to show Pharaoh's order that all newborn male Hebrew babies be killed and their bodies cast in the Nile, so that the deliverer of the Hebrews will also perish. The next scene shows Jocheved, the mother of Moses, putting him in a basket and float him on the river Nile to save him from the mass murder of all the children. The basket was found by Batyah, the sister of the Pharaoh and she brought Moses up as her baby in spite of her maid warning her that the cloth in the basket was woven by Hebrew hands. The scene shifts to a full grown Moses who has won favour with Seti after conquering Ethiopia and is now put in charge of building a new city for Seti – the Pharaoh. Continuing on, the next dramatic scene shows an old woman whose dress is caught under a stone being moved for construction. The Egyptian taskmasters do not allow the stone to be stopped and she is in danger of being crushed. 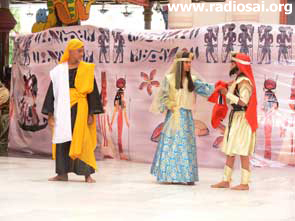 Lilia runs to Moses for help when Joshua is restrained, and Prince Moses frees the old lady. Moses then questions Joshua why the Hebrews work so slowly. Joshua asks for enough food to eat and a day of rest to recover, to which Moses agrees. Seti hears about this and comes to visit, and sees the slaves working hard to raise an obelisk. In appreciation, Seti calls Moses a Pharaoh in-the-making and thus raises the ire of Ramesses, the son of Seti. The next scene shows the transformation of Moses as he hears the maid-servant discuss with his mother that Moses is a Hebrew by birth from the cloth in the baby basket. The Pharaoh to-be spurns the throne and lives among the slaves. Batyah pleaded with him that the truth will never be told and he should come back to the palace, but Moses refuses as truth was his very life. One day an Egyptian taskmaster was beating a slave cruelly, and an angry Moses kills the task-master and saved the slave. For this he was shackled and brought before Seti. In a dramatic scene between Moses and Seti, Moses explains that there is only one caste - the caste of humanity. He says it is evil to enslave men because of their caste and creed. The angry Seti left after telling Ramesses to sentence Moses, and after announcing that Ramesses will be the future Pharaoh. 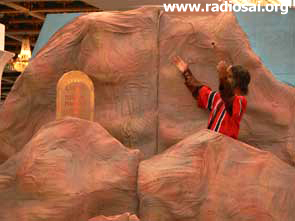 Ramesses banishes Moses into the desert. Moses with a staff in hand wandered over the desert till he reached Median, met Jethro and married his daughter Zipporah. He became a shepherd and tended sheep. One day Joshua came and implored Moses to redeem the Hebrews. Seti was dead and Ramesses was persecuting the Hebrews more than ever. Refusing to accept that he was the deliverer, Moses climbs up the mountain, where the Voice of God asks Moses to redeem the Hebrews and take them out of Egypt. For 7 day and 7 nights, Moses argued but God was adamant and His will prevailed. Moses then came to the Pharaoh and asked him to free the slaves. The Pharaoh laughs. Moses turns the river Nile into a river of blood. The pharaoh pleads with Moses to turn it back into water and that he will let the people go. Ramesses does not keep his word (because of the taunts of his queen) and Moses says that now a deadly plague will enter Egypt and kill the first born in every home. The Pharaoh’s own son is dead and even his God Sokar could not save him. Finally, in humiliation, the Pharaoh asks Moses to take his people and leave. A song and dance of celebration is then shown. 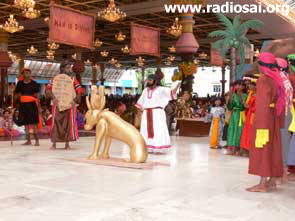 After Moses leaves, the queen sways Ramesses again to go behind Moses and avenge his son’s death. He leads his cavalry, pursues Moses and catches up with them on the shores of the Red Sea. In the most trying moment of his life, Moses remains calm. The Lord tests and brings one to the point of complete surrender – and at the last moment, when there is no ray of hope, He rushes to help. Moses prays to God and raises his staff over the sea. A wind blows and the waters of the red Sea are immediately divided and gather into a wall on either side leaving a dry passage in the middle. The children of Israel were thus safely taken to the other shore, but when the soldiers tried to pursue them the waters closed in and the Egyptian army was destroyed. The song of praise was then heard. 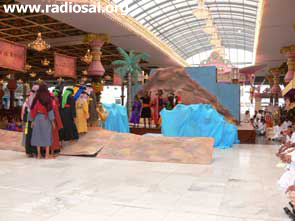 Leaving the Red Sea behind, the children of Israel finally reached Mount Sinai. One day in prayer, Moses heard God’s voice asking him to ascend Mount Sinai to receive the Ten Commandments. If one has to enquire why Moses was the chosen Instrument of the Lord for the deliverance of the people from slavery at the hands of the Egyptian Pharaohs, the answer will indicate that his principal qualification was his adherence to truth, his upright character, unity of thought, word and deed, a great sense of justice and his ability to be equanimous both in glory and in fall. Moses was the rare combination of confidence and humility. Real humility means transcendence of the self. He lived with the slaves and worked with them. Thus, Moses was for God - "a treasure out of all people". Moses was exhorted by God to ascend Mount Sinai and receive the Ten Commandments. Two tablets of the Ten Commandments written by God himself and the entire Torah were given to him. At this point the Ten Commandments were read to the entire gathering, to a dramatic effect. In Moses’ absence the word was spread that Moses would not return. The Jews start arguing about selecting a new leader. They finally made a golden calf with all the gold they had and they worshipped it. Moses was blazing when he came down and saw all the revelry and ritual. He chides them for how soon their faith in god is shaken. All are repentant and vow to follow him. Moses went up Mt. Sinai again and pleaded forgiveness from God for the behaviour of the children of Israel. 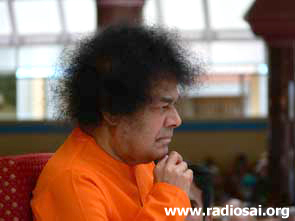 Moses is a great example of the teachings of Bhagavan Sri Sathya Sai Baba where Man is exhorted to manifest Human values in action and wear the jewel of character in day to day life. This was clearly expressed in the finale song. The entire drama was very moving with good visual and sound effects that created a sense of realism and the feeling of being transported through time back into Egypt. But the celebrations were not over yet. There was more on the morrow. The following day was a veritable treat for music lovers. We were treated to high quality Indian classical music fare, both in the morning and in the evening, by musicians from the state of Maharashtra as a continuation of the Ashadi Ekadashi celebrations from the previous day. In the morning we had a Carnatic vocal concert by Sri Krishnamurthy, a Music Director, vocalist, flautist, percussionist and a pianist hailing from Mumbai. After this presentation we had further excellent musical treats in store in the afternoon with an instrumental music performance followed by a Ms. Richa Sharma concert. Sri Krishnamurthy is not only a music director of repute but is a rare breed of musician who is not only adept at playing the flute, the piano and percussion but also penning lyrics in Indian languages and Sanskrit. He has toured the USA, the UK, France, Germany, Russia and the gulf countries and has commanded great respect for all his musical works. Sri Krishnamurthy combines youthful zest, a firm grounding in classical music with progressive expressions to reach out to all music lovers from all parts of the world. Sri Krishnamurthy has released many albums in different genres. 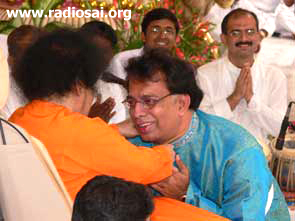 His devotional bhajans and flute vocal concerts’ albums have been well received. 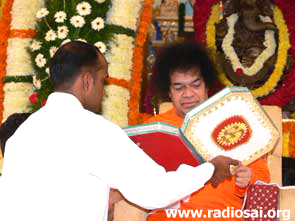 He also has released many Sai bhajan albums like Sai Prem Avataara, Sai Prem Tarama, Mohan Sai and Sai Amrit. Sri Krishnamurthy sang the vocals while playing the harmonium. He was accompanied by Sri Vinod Sehgal on the flute, Sri Shantanu on the tabla, and Sri Rajesh on the violin. He sang Swaagatham Krishna (in raag Mohanam), Brochvarevarura (raag Khamas) and a Meera Bhajan Baso Mere and finally Vittala Vere (in raag Janardan Sarum). Swami made a chain for Sri Krishnamurthy and lovingly put it around his neck. He also manifested a ring for the flute player Sri Vinod Sehgal. The evening programme was a double header with the first being an instrument medley followed by a vocal concert by the very popular playback singer Ms. Richa Sharma. The first item was an instrument medley comprising the tihayee (trio) of instruments – the sitar, the sarod and the tabla. Playing on the sarod was Sri Surmani Rajan Vinayak Kulkarni, with Sri Sudhir Phadke on the sitar and Sri Nishikant Barodekar on the tabla. 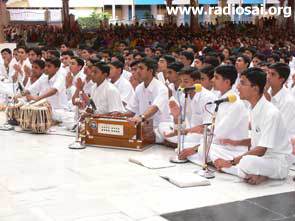 Sri Kulkarni received his first music training under his father the Late Pt. Vinayakrao Kulkarni and his uncle the late Pt. Raghunathrao Kulkarni from the age of 2. Initially he trained on the tabla till the age of 17 and had accompanied top musicians all over India. Attracted to the deep tonal quality of the sarod, at the age of 18, his interests shifted. In 1978, he became the disciple of Pt. 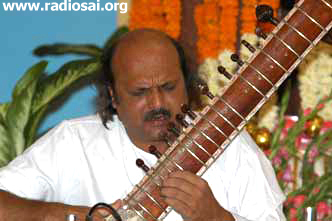 Ratnakar Vyas of Mumbai and received formal training in the sarod. In his playing style, he concentrates mainly on the ‘Gayaki Ang’ during the ‘Alap’ and ‘Jod’ but shifts to instrumental style when the tabla picks up. He has had a distinguished career playing for All India Radio and Doordarshan, as well as making music for television serials, ballets, documentary films and advertisements. The sitarist Sri Sudhir Phadke was born in Pune, Maharashtra in a musical family where his father used to conduct sitar and vocal classes. 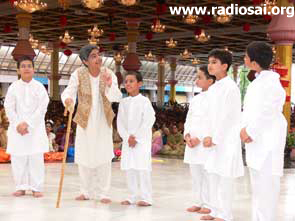 Sri Phadke thus began his initial lessons with his father. Later he was accepted as a student by the great sitarist Smt. Annapurna devi (sister of Ust. Ali Akbar Khan and the wife of Pt. Ravishankar), under whom artistes like Pt. Hari Prasad Chaurasia are still learning. Sudhir has performed in all the major festivals in the country and has been to the USA, S. Africa, and Dubai fro concerts. He also has several music albums to his credit and regularly performs for All India Radio and Doordarshan. The young tabla player, Nishikant Barodekar began imbibing Indian classical Music from his grandmother, the legendary vocalist Smt. Hirabai Barodekar, and under the initial guidance from the veteran musician Ust. Ghulam Rasool Khan, Nishikant began his tabla lessons and after 7 years of training with his guru mastered the intricacies of the Delhigharana style of table and was awarded the national Scholarship for the years 1979 and 1980. Since 1982, Nishikant has been a traditional ‘Ganda-Bandh-Shagird’ of the world renowned tabla maestro Ustad Alla Rakha. Under the keen tutelage of the Ustad of the Punjab Gharana and an abundant training in the traditional percussion style from the maestro’s eldest son, the genius Sri Zakir Hussain, Nishikant has developed a style that is distinguished for a fine sense of rhythm, versatility and eloquence. Nishikant has performed with artists like Ust. Vilayat Khan, Pt. Birju Maharaj, Pt. 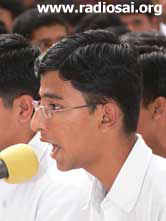 Shivkumar Sharma, Pt. Bhimsen Joshi, Pt. Jasraj, John Maclaughlin, L. Shankar, Ust. Sultan Khan and with Ust. Zakir Hussain. The ease with which Nishikant accompanies veteran as well as young Indian classical instrumentalists, vocalists, South Indian and Western instrumentalists especially fusion Jazz speaks of the discipline and dedication with which this talented young musician has pursued music. Sri Nishikant is also a visiting faculty with the Sai Mirpuri College of Music and his young students have many a time expressed to us their gratitude for the training that he is giving them. The trio played two ragas - Hemant and Mishra Pahadi. 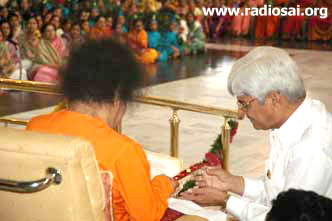 At the end of the concert Swami made a ring for Sri Kulkarni, the sarod player, to his unabashed astonishment and joy. The next was an absorbing vocal concert by Ms. Richa Sharma. Ms. Richa Sharma today is one of the most respected and talented singers in Bollywood (the Indian version of Hollywood in Mumbai) having worked with almost everybody in the music fraternity. And what sets this young singer apart is her full throated classy voice! 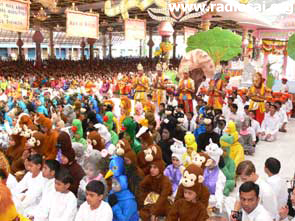 Richa Sharma is the youngest of seven children of a temple priest in Faridabad (Haryana). Her father Pandit Daya Shankar Upadhyaya and mother Manorma Devi taught young Richa the art of singing bhajans, particularly Mata Ke Jagran, which slowly and steadily became Richa’s destiny in the initial years of her life. Under the tutelage of Pandit Aaskaran Sharma, Richa went on to get proper training in Indian classical and light music. She made her debut in Bollywood with Sawan Kumar’s SALMA PE DIL AA GAYA in 1996 and followed it up by a number of films until the big hit came by in the form of TAAL where she sang for AR Rahman. Thereafter a spate of hits followed one after the other and today Ms. Richa is riding high on the wave of success. The versatile playback singer has also done quite a few albums to showcase her talent. A small town girl who began life singing at God’s home is today one of Bollywood’s biggest success stories. And the wheel has come full circle for after striking it rich she came today to sing again in God’s home in the divine presence of God Himself! 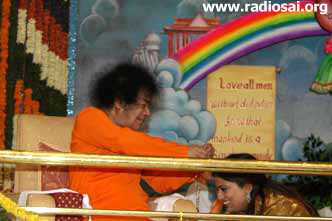 And Swami showed His appreciation by manifesting a navarathna mala for her at the end of her concert. Ms. Richa Sharma was accompanied by Sri Narasiha Kulkarni on the harmonium, Sri Vinod Sehgal on the flute, Rakesh on the tabla and Sri Lala Ram on the dholak. The chorus singers were Mrs. Thanu Pandit, Ms. Jyothi, Sri Rajesh Sharma, Sri Vinu, Sri Yogesh, Sri Ashok and Sri Shishunath.Ms. 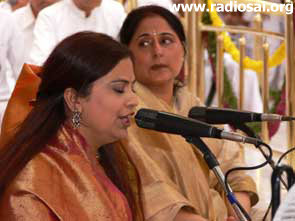 Richa Sharma sang 4 songs that evening – Dham Dham Mast Kalandar, Meera Kahe, Chap Tilak, and the bhajan Sai Baba Tera Naam. They came quite suddenly to the Ashram and graced the Sai Kulwant Hall for a couple of days - tall, graceful Tibetan monks in long red robes. Everyone was curious – where did these dignified monks come from. 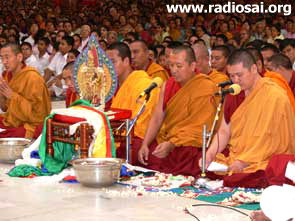 These Tibetan monks were also graced by Swami when after seeing them seated on the side on July 8 th during the music concert in the evening, He explicitly signalled to them to seat themselves right in front of the dais. Signal honour indeed! The humbleness of spirituality and nobility of the innocent was reflected in the hearts and faces of these eighteen Tibetan Buddhists masters when they chanted 5 specially selected Tibetan Mantras on the 9 th of July, right before the Guru Poornima festival. 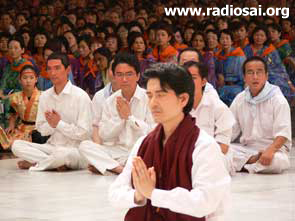 The programme of getting these Tibetan monks to chant these mantras in the Divine Presence was initiated by a Sai family from Singapore to give thanks for the Divine Love, Blessings and Guidance that our Most Loving Bhagavan has constantly bestowed on all of us. These Tibetan Buddhist masters hail from the Sera Jhe monastery, an austere community with over five thousand monks, each serving the Buddha and cultivating his Bodicita. Sera Jhe was founded in Tibet in the 15 th Century. After the Chinese occupation of Tibet in the 1950s, His Holiness the 14 th Dalai Lama reestablished the monastery in Byalakuppe in the district of Mysore, Karnataka. 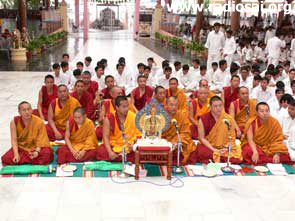 This is the largest Buddhist institution in India today and is reputedly one of the greatest institutions of spiritual learning. He expounded that “forms and names are many but God is one” and that the unhappiness in one’s life is caused by one’s desires. Such simple yet profound words had a visible effect on the Tibetan Buddhists masters, and they mentioned in the satsang held later that evening, that they were speechless, and being with Baba had permeated their entire souls with nothing but peace. Swami too manifested His love in the form of three gold medallions with the image of Chenrezig, Guan Yin (Goddess of Mercy) and Lord Buddha and a gold Rudraksha japa mala with 108 beads for the high Tibetan Buddhists masters. Such gifts were significant for the Tibetan Buddhists masters, not for the material value they held, but for the symbolism and love they represented. The Tibetan Buddhists masters also mentioned that it was blissful being with Swami, and they would have stayed the evening with Him in the interview room if possible, as it seemed that Swami had no concern with regards to time. Indeed the interview stretched for an hour and a half. 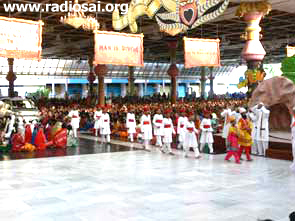 Permission was given by Our Divine Gracious Bhagavan at 5:30 pm for the programme to commence. An intricate statue of the thousand-armed Chenrezig was offered to our Most Loving Bhagavan. Along with the Chenrezig statue an offering of 5 Jnani Buddha Katas (a Tibetan tradition of greeting respected individuals with an offering of 5 different coloured silk cloth). “Dorje’s” (a Tibetan amulet), specially handcrafted by Tibetan Lamas were then blessed. As these dorjes were being handcrafted, the Lamas would chant the Avalokitesvara mantra to invoke His blessings. The dorje is the quintessential symbol of the “diamond vehicle” or Vajrayana Buddhist path. The vajra essentially symbolizes the impenetrable, immovable, immutable, indivisible, and indestructible state of enlightenment or Buddhahood as vajra mind. In ancient India , the vajra, as a thunderbolt, became the chief weapon of the Vedic Sky-God Indra. 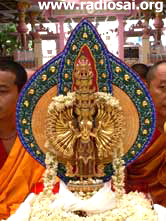 According to a Buddhist legend, Buddha Skakyamuni took the vajra weapon from Indra and forced its wrathful open prongs together to form a peaceful Buddhist scepter. This auspicious dorje symbol can be used to ward off negative energies, and for protection against harm. Mantra of Avalokiteshvara is to generate love and compassion. The Mantra of Medicine Buddha is not only to eliminate the pains of diseases but also helps to overcome the inner sickness of attachment, hatred, jealousy, desire, greed and ignorance. The Mantra of White Tara has the power to grant longevity and overcome life’s obstacles. The Amitabha Buddha Pure Land Mantra grants one to be reborn in the Pure Land where in the absence of suffering one can pursue the practice of Enlightenment. The Kalachakra Mantra is a prayer for universal peace and harmony. These Tibetan Buddhist mantras are always recited silently within oneself just like Namasmaranas. But these masters made exception that day, to chant aloud in our Most Loving Bhagavan’s divine, pure, and holy presence. 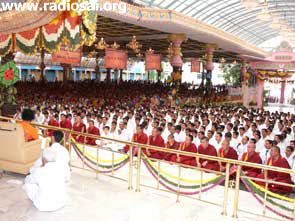 In accordance with Tibetan religious tradition, the chanting was concluded with dedications done in both Tibetan and English so that all the merits generated by this chanting would be dedicated to all the beings in the 6 realms and all the worlds. Permission was given to the 5 senior Tibetan Buddhist Masters; Geshe Wangdu, Geshe Lobsang Gyaltsen, Geshe Tsewang Dorji, Geshe Tsetan Tashi, and Captain Ong to present our Most Loving Bhagavan with yellow “long life” katas to reaffirm their wish for a long and healthy life for our Most Loving Bhagavan to continue His Mission in His Present Form. 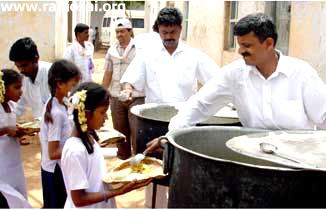 Prasadam in the form of “dorjes” and apples were then blessed and distributed. Geshe Choyin writes, “I went with 18 lamas to do some prayers at Puttaparthi. For a long time I couldn't whether decide to go on this trip or not. On one hand, I think it is good to see him and do some prayers there, but on the other hand, I was concerned about missing my class. (Geshe Choyin is the resident teacher in the Amitabha Buddhist Center in Singapore and he didn't want to miss teaching his pupils.) It was not till the last minute that I'd decided to go to Puttaparthi for the prayers. I flew to Bangalore the next day and arrived at Bangalore about 10PM. I spent a night there. The next morning, I took a cab to Puttaparthi and arrived there at about 9:30 AM . We were going to start the prayer in the afternoon at 3:00PM. Somehow, Baba came earlier at 2:30PM. He called all the lamas to meet with Him (Swami called them in for an interview) and we all gathered around Him. He smiled at us and asked each one of us our names and where we came from. Later, Baba asked 2 monks what they wanted and they both replied that they wanted Buddha. Baba then performed a miraculous act of manifesting 2 Buddha pendants from His hand and gave them to the 2 monks. Then He turned to His right, looked at me and commented that I am a happy person. 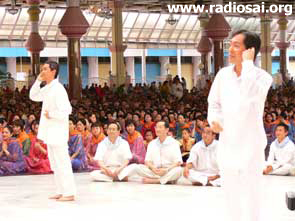 He asked who is doing the chanting; then again He performed another miracle. A rudraksha mala manifested from His hand and He put it around my neck. 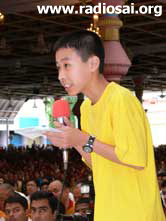 During the course of the meeting, He also manifested a diamond ring for Dorje (the Buddhist name of the young MC for the evening, Sai Keet Ong). It was quite amazing how He manifested these miracles. The audience with Baba lasted about 1 1/2 hours. During this time, He gave much good and beneficial advice to us. The evening before the celebration of Guru Poornima is always one of high expectations. Many programs are prepared and vie with each other to fill this coveted time slot. This year we had two programs blessed by Swami Himself to be performed in front of the festival crowd in Sai Kulwant Hall. One was a dance program called “Abhinayanjali” by the students of the Institute and the other was a concert by the Bailey sisters and troupe from New York City. These boys had performed a dance program earlier on July 6 th using 4 specially choreographed dance sequences. 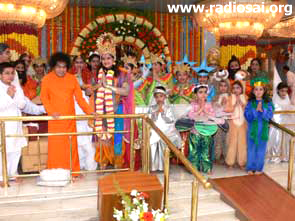 Swami was pleased with their performance that day and had honoured them then by asking them to change and assemble in the mandir before the start of the bhajans, where He talked with all of them for a few minutes as a visible sign of His pleasure and benediction. He further blessed them to perform again in front of the massive crowd that had assembled in Sai Kulwant Hall on the eve of Guru Poornima. 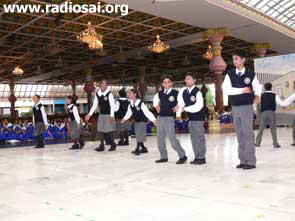 The boys had presented these dance forms not only as an offering to their beloved Lord but also as an outward expression of their innermost feelings and reverence towards Him and their gratitude for all that He has taught them. 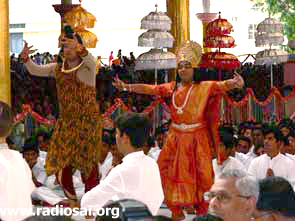 So each dance was preceded by a small commentary in Telugu and in English, followed by the dance set to a song specially chosen for the lyrics and the bhava it conveys. For this special concert the boys had added two more songs and presented a beautiful bouquet of six well choreographed dances to the immense delight of all. The first dance was a Shiva Tandava dance, set to the song “Aananda Thandava Maade, Mahadaananda Thandava Maade”, a song that extols Shiva in His Tandava - tandava means dance. Dance is an expression of duality just like Matter and Energy, Purusha and Prakrithi, Shiva and Shakthi. Life dances to the tunes of desires, suffering dances to the tunes of duality, and Creation dances to the tune of the Creator. This feeling was well conveyed in the dance performed by 10 boys. 10 dancers again expressed the sentiment in the next dance that the Divine Effulgence is so magnanimous that language cannot bear the burden of its expression and understanding becomes numb in front of the beauty of ecstasy. One can then only bow down in submission and servitude. 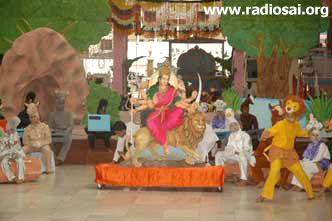 Set to the song, Ramayye Rajayye nantaa raghupathi, Aaanandam andinche nanta. Seethamma samethudantaa Dhasharadhi, Sirulenno Kuripinchi nanta, which extols Rama as the bestower of the ultimate bliss – Ananda, the giver of imperishable wealth, the protector and father of everyone. The next dance expressed one of the profoundest of thoughts - of the unity of everyone and everything. Perceiving inequality in existence, the boys said, is an outward expression of innate ignorance. Diversity in outward appearance is a channel through which human understanding shall flow, to merge in the endless ocean of unity. Set to the very popular song “Brahmam Okkate, para Brahmam okkate” which tells us about the oneness that is seen in the world. It tells us that the hot scorching Sun is the same for both – the mighty elephant and the dog. It also tells that highly learned Brahmin and the ignorant and the untouchable are born and lead their lives on the same soil. There is no difference between any of them. All are but different forms of Brahman and that Brahman is one! “O Lord! Thy name is a path to my feet and a lamp to my life. Thy name is Thy Hand that wipes the tears of my soul and tends the wounds of my heart. In thy name shall I lay my life and my love”. 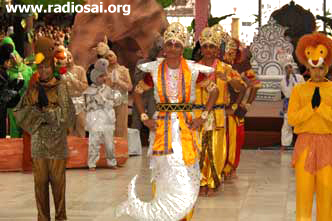 This was the sentiment of the fourth dance rendered to the song, “Oh Raama nee naama entho ruchira. Entho ruchi (2x) entho ruchi ra”. 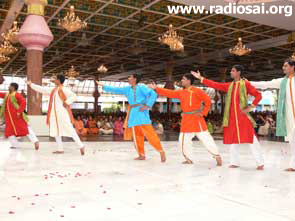 The lyrics of the song highlights the value of the name of the Lord (Rama). In this age the only way to liberation, one’s final goal is namasmarana or chanting the name of the Lord. Most sweet is the name of Lord Rama. Sing His name and in that lies all the eternal bliss. The next was a very vibrant dance set to a fast pace as it expressed the rhythm of life. "Rhythm is the instinct of creation, Harmony is its intuition. In the droplets of rain, in the surging waves of the sea, in the humming of the bee, in the twinkle of the star, I see it, I feel it and I call it as DANCE." The last song of the evening was a Hindi song Thaal se Thaal milakar, Jhoom (3x) Jhoom ke nacho aaj or dance enthusiastically today in tune to the beat, conveying that the boundaries of the mind are the barriers to evolution. The eternal knowledge redefines the boundaries. In the inner-most realms of my heart, I found the destination of evolution, I called it Oneness. I called it Unity. I called it Love! The Bailey Sisters, Audrey and April, hail from a spiritual and musical family in New York. They grew up singing at myriad family school and church affairs. The sisters first learned of Sai Baba while watching the film, “The Lost Years of Jesus” but could not find any additional information about him until 1986. During the Christian Easter celebration, in the Spring of 1986, they finally found a book entitled “Baba” by Arnold Schulman. They identified with Baba’s teachings “Help ever, Hurt Never” and “Start the day with Love, fill the day with Love, end the day with Love” because these principles mirrored the Christian theology of Jesus Christ, and so the sisters became devotees. 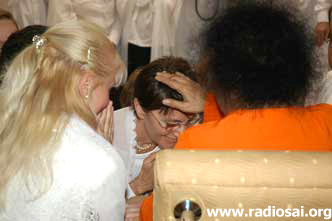 April was the first to travel to Prashanti Nilayam to see Swami in the winter of 1986. In 1988, Audrey, her younger son Christopher and their brother Warren Bailey accompanied April to see Sai Baba, and Warren also became a devotee on that trip. April began composing songs of love and devotion for Sai Baba and His Divine Mission. 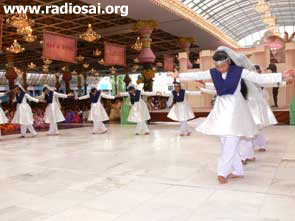 Upon returning to the U.S.A., the sisters began travelling to events sponsored and hosted by Sai devotees. These two were the initial singing members of what would eventually develop into Sai’s Nine Singing Group. The group grew as they continued to travel and sing at more Sai organization events, as several knowledgeable Sai devotees expressed a desire to join with the sisters in singing these musical expressions of Swami’s divinity and love. 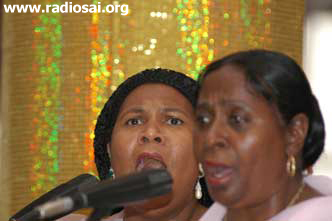 In their concert, the Bailey Sisters and Sai’s Nine sang five songs from their CD “God Lives in India”. 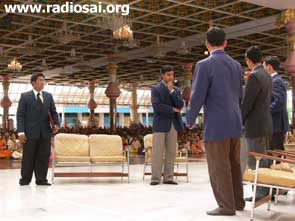 The inspiration for this CD as well as the song “God Lives in India” came from a gospel song and a speech of our beloved Lord. April Bailey recalls hearing a gospel tune with the theme that people should acknowledge their belief in God. It states, “If you are aware that you have been helped and blessed by the Lord, you must never be afraid to say so”. A similar theme was published in Vol. 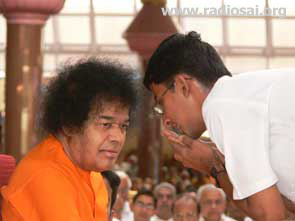 2 of Sathya Sai Speaks, wherein in Chapter 47 entitled “On to Victory”, Bhagavan says, “When someone asks you in great earnestness, where the Lord is to be found, do not try to dodge the question. Give them the answer that rises up to your tongue from the heart. Direct them. He is here in Prashanti Nilayam”. 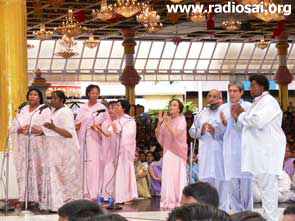 The five songs that the Bailey Sisters and Sai’s Nine sang that evening are “Celebrate the Birth of Sathya Sai”, “I am Never Alone”, “Why Fear When I am Here”, “Our Only weapon” and of course the theme song, “God Lives in India”. 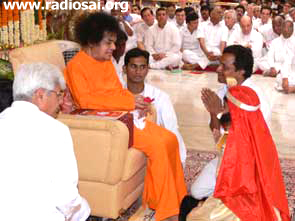 Swami was welcomed into Sai Kulwant Hall by the boys playing Nadaswaram Music on the morning of Guru Poornima. 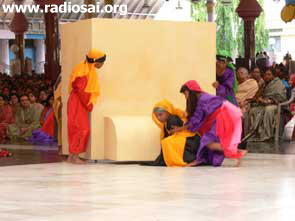 After Swami got down from His car, the first thing He did was cut the massive Guru Poornima cake prepared by Italian devotees. This cake preparation has become a staple in all major festivals and is artistically done and decorated usually to a motif befitting the occasion. 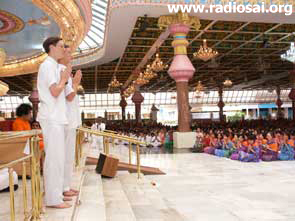 After giving His darshan Swami blessed the boys by asking them to start the morning’s programme. 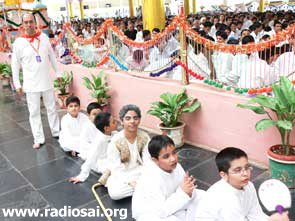 All the 500 boys of the Institute had been practising for the last few days a list of stothrams to sing in the divine presence on this holy day and all the stothrams selected had a special significance for the Guru. One of the boys had prepared a special card outlining the stothrams that they would be singing and showed it to Swami for His blessings. The Institute boys chanted the following stothrams in the morning: Guru Paduka Stothram, Guru Nathudave Goori Choopthive, Sume Supta Gandham, Easwaramba Sutani Devomi and Madhuram Nee Ganam Yento Madhuram Madhuram Nee Ganam. 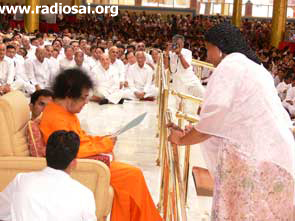 Swami’s attention was then drawn to the back of the Hall where a number of tricycles were arranged for distribution to the needy. These were hand-pedalled tricycles and were for distribution to those special people who had lost their legs or were unable to use them. 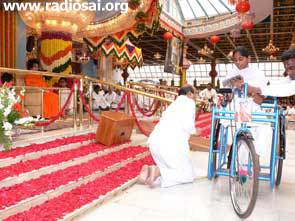 The recipients had been selected from the villages close to Puttaparthi and were brought to Sai Kulwant Hall to be blessed by receiving the tricycles from the divine hands directly. 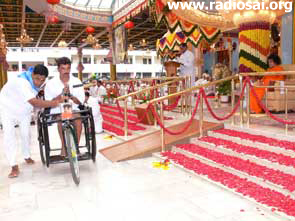 As the State President of the Sathya Sai Seva Organizations of Andhra Pradesh called the names of the recipients, they were helped onto the tricycle and it was wheeled up to Swami so that they could receive His blessings on this auspicious morning. A total of 51 people (41 males and 10 females) were benefited this day. Swami then asked the boys to sing bhajans. The bhajans sung by the boys were Sakshat para Brahma Sai, Sadguru Brahma Sanathana, Guru vara Naam, and Guru Baba and a few more. They were accompanied by 2 keyboards, 2 tablas, 1 flute, and 1 violin and had 3 lead singers. After distribution of prasadam and arathi, Guru Poornima’s morning celebration came to a close. 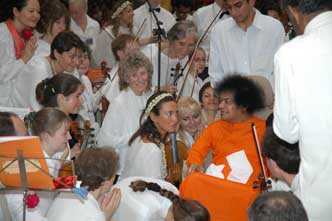 The evening of the Guru Poornima festival is now synonymous with the Sai Symphony orchestra, a mix of musicians from the different countries of the world who come to the Lotus feet and play in harmony – all reading from the same sheet of music. This year 67 musicians assembled in Sai Kulwant hall from 21 countries around the world. The countries included Japan, Italy, the USA, Switzerland, India, the Czech Republic, Turkey, Lithuania, New Zealand, Germany, Austria, Macedonia, Spain, Malaysia, Russia, the Netherlands, France, Colombia, Denmark, Belgium and Croatia. 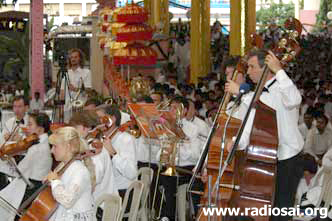 These 67 musicians played on a number of musical instruments like the violin, the violas, cellos, bass, oboe, bassoons, the clarinet and the bass clarinet, the flute – Piccolo, the flute, the trumpet, the trombone, the French horn and the English horn, the keyboard harp, the timpani, cymbals, the tambour and an assortment of percussion instruments. Sai Kulwant Hall had become an opera house for the evening. 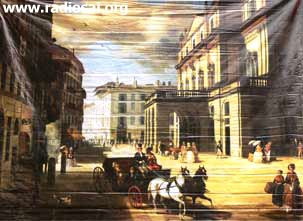 On both sides of the veranda – a huge banner of the La Scala Opera House, one of the most famous opera houses in the world in Milan, North Italy, was hung and lent the right ambience for this Western classical fare. Chairs were laid out in concentric semi-circles with all like instruments sitting together - the violins in the front and the big percussion instruments in the back. The 67 musicians lent a very dignified air to the entire proceedings when all of them trouped in, dressed in black and white ‘penguin suits’, carrying their oversized instruments and quietly took their allotted places. Quickly and efficiently they tuned their instruments or else quietly meditated, preparing themselves mentally to give their best when they played for the Lord. We could not help but reflect on how much trouble they must have taken and how much effort they must have expended in not only freeing their schedule to be available to play in Sai Kulwant Hall in July in what must be the middle of their busy summer season, but also in transporting their oversized and heavy instruments carefully through myriad airport and plane transfers and the bone jarring ride from Bangalore in order to reach this rural hamlet of Puttaparthi. Truly it is only divine love that can invoke such sentiments and inspire such sacrifices! Swami Himself came to Sai Kulwant Hall looking exuberant. It was purely the patent love of these musicians and their unalloyed devotion which drew Swami quickly to Sai Kulwant Hall, we felt. The musicians well conducted by Klaus Maurer of Switzerland, quickly got into their routine. The first song they played was a Karl Maria von Weber composition, Invitation to dance – Op. 65 – Rondo Brillante. They followed this up with a Franz Lehar composition, Guld und Silber – Op 79 – Walzer. George Friederich’s Handel’s Watermusic – Suite II was played next followed by Gioacchino Rossini’s II Barbiere di Siviglia – Ouverture. Charles Gounod’s composition for flute and piano enthralled the audience and N. Rimsky Korsakov’s Capriccio Espagnol – Op 34 – Fandango Asturiano was next. 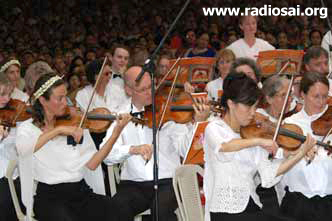 The last 2 pieces that the orchestra played for the audience were Giuseppe Verdi’s Aida – Marcia Trionfale – No. 5 (Finale Atto II) and Edward Elgar’s Pomp and Circumstance – Op 39 – No. I in D Major. At the end of the concert there was a moments silence while the audience drank everything in and then realized that it was finally over and broke into loud applause. And what followed next can only be vaguely termed as a “love feast”. 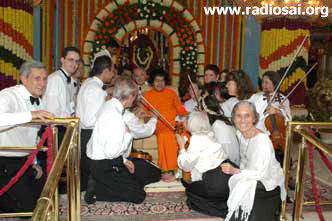 Swami invited the musicians to come in groups and have their photos taken with Him. But when each group went up to Him, they did not want to tear their eyes away from that enchanting face and look back to face the cameraman. Many endearing words were said, He blessed many a musician by placing His beneficent Hand over their heads and it went on for quite a while, till everyone had drunk their fill and there was scarce a dry eye. 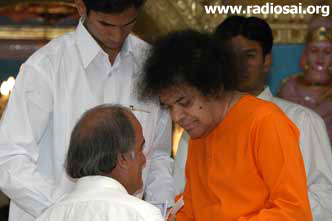 And finally Swami went in for a few moments into the interview room. We thought it was all over but no – when He came back. He wanted to move around where the musicians were seated blessing them all once again. Finally arathi was taken; bringing to an end what must surely be a memorable Guru Poornima evening! 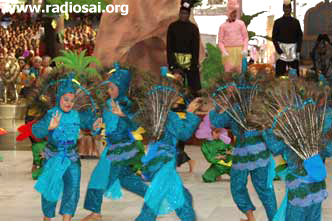 After a gap of two years, the children of the Sai Centre of Jakarta, Indonesia, were given another opportunity to perform in the Divine Presence. 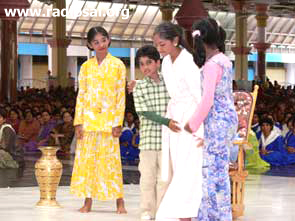 They had last performed in the year 2004 when they had put up a drama called “From Humanness to Divinity”. Though the time given was short and even with examinations looming around the corner, the Bala Vikas teachers seized this opportunity of performing before the beloved Lord, and joined together to prepare the programme. 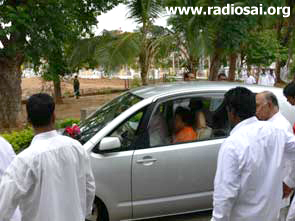 The team arrived in Puttaparthi on the 6th of July. As everyone experiences at one time or the other, they were put to the ‘test’ this time around. It was after darshan on the morning of the 12th and still there was no news as to when the children would be allowed to perform. They were all scheduled to return back on the evening of the 13 th and so they thought that they had just one more chance to perform on the morning of the 13th (if they were informed on the evening of the 12 th). 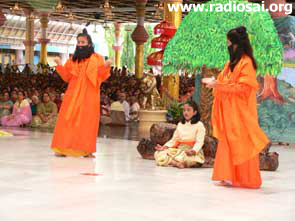 None of them thought that Swami would allow them to perform on the evening of the 12th. 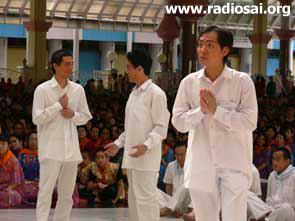 At around 3 PM on the 12th, Swami sent word that the Indonesians were to perform that evening itself! And they were given thirty minutes to get ready. 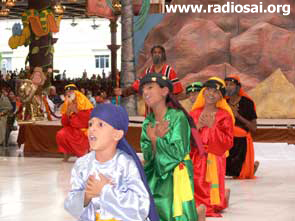 30 minutes for all the children to go to their rooms, wear their costumes, put on their make-up and return to Sai Kulwant Hall! And as if this test was not severe enough, after all the children reached their rooms it started raining very heavily. A couple of the organisers went to the bus-stand across the road, to see if they could rent a bus to bring the children back in their costumes without them getting wet. And what did they find – that due to a state-wide strike called by the Opposition party all public transport buses were off the road for the day. 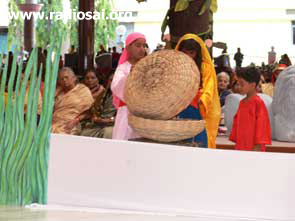 And this mini-drama was happening in the full view of the entire crowd of devotees present in Sai Kulwant Hall that day. The Indonesians were grace personified under all this pressure. They went about their tasks gamely, still happy that they had been given the coveted chance to perform in front of the Lord. And the Lord who often says “Your test is my taste” then quickly came to their rescue. The owners of a couple of large vans which were parked just outside Sai Kulwant Hall put them at the disposal of the Indonesians to transport the children and their sets and props. Some of the Indonesians worked unitedly as a team to put up the props, the others quickly dressed up the kids and brought them to Sai Kulwant Hall by 4 PM. And by the time the kids were dressed the sudden downpour had stopped equally suddenly and everyone could come comfortably to Sai Kulwant Hall without getting wet. And the all merciful Lord gave them some more time to settle down. He came out only at 4:20 PM, looking very innocent with perhaps just the slightest trace of a mischievous smile on the corners of His lips. The Indonesian children had won everyone’s hearts (including His) even before the drama had started! It was an abject lesson in surrender, a lesson that if we accept everything as His Grace and go about our tasks cheerfully, He cannot help but come to our rescue in full measure, unasked and unsolicited. They had elected to put up one of the enduring tales of God’s love from the Bhagavatham - the story of Dhruva. This Holy Scripture contains the lives of exalted souls, which when read and ruminated upon sanctifies our lives. The Bhagavatham is nothing but God’s love from start to the finish. 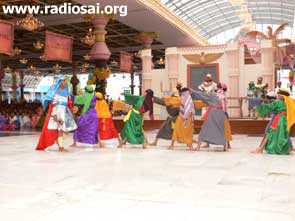 The girls started with a colourful dance to the song - “Jai Jai Ram Sai Ram. 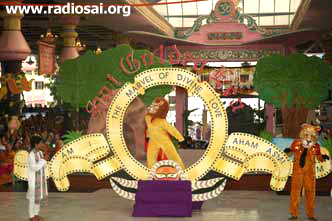 Do Akshar Ka Pyaara Naam”, a melodious song that hails the glory and love of Sai, before depicting the story of Dhruva. The Dhruva story is shown as if it is related by a grandfather to his grandchildren. Prince Dhruva, a tender and young boy of five years, obtained immortal fame, and was graced with the Lord’s love and constant presence within himself through the strength of his determination and devotion to the Lord. Thousands of years ago, in India, there lived a king by the name of Uttanpada. He had two sons, Dhruva and Uttama. Dhruva was born to Suniti, the elder queen. She was a noble and pious lady. Uttama was the son of Queen Suruchi, the younger queen who was arrogant in nature but was the king’s favourite. One day while the King sat on the throne, Queen Suruchi denied Dhruva a place on the king’s lap. This hurt Dhruva deeply and he vowed to achieve a place significantly higher than his father’s lap. He took his mother’s blessings and left the palace one night to attain his goal. On his way to the forest, he met the sage Narada, who instructed him to worship Vishnu, the Lord of the Universe, and gave him the manthra “Om Namo Bhagavathe Vasudevaya”. After long and arduous tapasya (prayers), Lord Vishnu was very pleased with this tender lad and granted him a high place in the Heavens. He became Dhruva Tara, the North Pole star, whose position in the sky remains constant, symbolizing his unwavering devotion in fulfilling his ambition. The play contained two more enchanting dances set to the songs “The five D’s” and “Be a Flower in God’s Garden, Be a Star in God’s Heaven”. Through His actions, not only in the Bhagavatham and the story of Dhruva, but also in the sequence of events that preceded the staging of the drama this afternoon, God has always demonstrated that there is no force greater than the power of devotion. Thus by developing the noble values of Duty, Discipline, Devotion, Discrimination and Determination, Dhruva contemplated on Divinity and earned the Vision of the Lord. These same noble qualities won also for these kids from Indonesia the Lord’s heart. He was very pleased with their performance and stood up and gave everyone the golden opportunity to have their photographs taken with Him. This presentation by the students of the Sri Sathya Sai School of Canada was an offering of love, reverence and gratitude to the ONE who started and created it all. 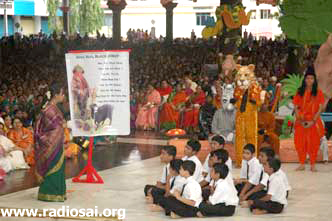 It was dedicated to the vision and the teachings of the School’s founder – Sri Sathya Sai Baba – for founding the school and making such a difference in the lives of its students. 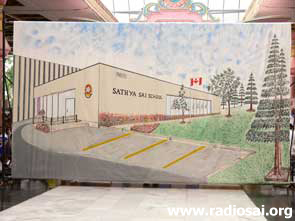 The Sathya Sai School of Canada was established in September 2000 as Sri Sathya Sai Baba’s gift to His devotees on His 75th birthday. The purpose of the school is to integrate character education and academic excellence within the mainstream Canadian school system. 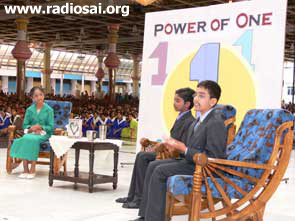 When Swami blessed the school project on November 17, 1999, He said, “Start small, grow big”. And they have done exactly that. The school began six years ago with 60 students in Junior Kindergarten to Grade 1. They now have 160 students in Junior Kindergarten to Grade 6. On the occasion of the celebration of Swami’s 75th birthday, the garlands on Swami’s photograph continued to grow and grew by an astonishing 75 inches. Just as the garlands which adorned his picture have multiplied in length, so too do the number of children who benefit from His education programme continue to multiply and increase. This year, their first group of students are graduating and leaving the School to spread the message of Love that they have learnt through the SSSEHV Programme at the school. As an expression of gratitude, the students came to Prashanti Nilayam to meet the founder of the school and offer this programme of love, with love, to the incarnation of love. 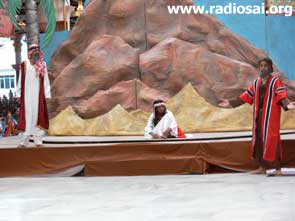 The programme was a dramatic presentation of what ONE individual can achieve, if the purpose is noble. Much of the dramatization was in the form of a flash-back that traced the history of the School, highlighting its uniqueness and the impact at the individual, family, social, national and global levels. It began as a conversation between three generations, namely – a grandmother, a mother and the grandchildren – in the year 2070. The grandmother reminiscences about her childhood when, as a young child, she went to a very special school in Toronto that moulded her to be the person she had become, namely a very successful humanitarian of outstanding accomplishments. Grandma Dr. Karen Joy shares the memories of her childhood with her daughter, grand-daughter Hope, and grand-son Earnest. 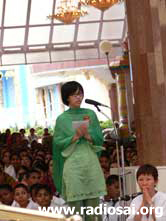 She tells them about her life as a student of the Sathya Sai School of Canada. Later the grandmother is interviewed on a TV talk show “Heart to Heart”. During the course of the interview the talk show hosts pull out a film from the archives of a programme that the grandmother and her classmates had presented in front of the founder in July 2006, when they were little children. The main metaphor that weaved through this presentation was the growing garland and its significance. The garland is a potent symbol and the miracle of the growing garland meant many things to many people. But for everyone, it signifies something that is sacred and blessed. 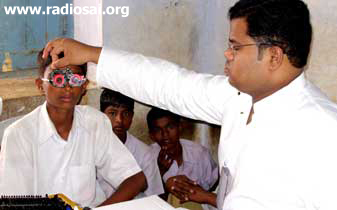 They see every student of the school as a petal in the growing garland of God. To celebrate 25 years of the Institute, all the departments are organising conferences and seminars in their respective fields inviting eminent men to share their knowledge and current research with all. The Department of Mathematics and Computer Science also organised a very well attended 3 day conference on NEXT GENERATION INFORMATION TECHNOLOGIES FOR SOCIETAL ADVANCEMENT AND INTEGRATION between the 15 th and 17 th of July. The conference was inaugurated by Sri Rajeeva Ratna Shah, Member Secretary of the Planning Commission, Government of India. The conference focussed on topics like Societal Applications of Information technology (IT), Next Generation Information Technologies, IT for Societal Applications, IT in Health and IT in Disaster/Emergency management. The conference was well attended by eminent IT practitioners and teachers from abroad representing Cornell University, University of Illinois at Urbana-Champaign IBM Corporation East Fishkill, New York, Intel Corporation, Arizona State University, the Weill Medical College of Cornell University, Philips Research laboratories in the Netherlands and General Motors, Detroit. There were also eminent speakers from India from Government Organizations like the National Remote Sensing Agency, and the Ministry of Information Technology, the Indian branches of Multi-National Corporations like Honeywell, Sathyam Computers, Motorola and so on. There was a poster board exhibition of research papers and also a panel discussion on Next generation technology. There were a total of 160 participants from India and abroad. As part of the IT conference, the M.Tech students in the Department of Mathematics and Computer Science put up a drama on the 15 th July entitled “From I To We To He”. The drama tried to focus attention on the fact that while technology has no doubt helped man, however the basis of technology is a selfish mind - with desires solely for his own concern. In the beginning, as a cave man, man invented tools such as clubs and stone implements (technology) to kill and thus fill his stomach. Since then the wheel, the fire, metal processing, the IC engine, the Industrial revolution, and now finally the IT Age have all symbolised man’s evolved mind to satisfy more and more of his desires. Technology is helping man crunch more and more activities in less and less time, thus freeing up more time. But unfortunately technology does not teach man how to effectively use the extra time. Thus the rat race for fulfilling more and more of our desires goes on incessantly at the cost of degrading our environment. Technology has helped Man travel from Vyashti (Individual) to Samashti (Society). Now he has to travel from Samashti to Shrushti (Nature) and from Shrushti to Parameshti (God). The drama starts with a company called Futronix building a nano-robot which can do amazing things for the human body. The Managing Director – Sampath, the Chief Finance Officer – Mani, the Chief Designer of this nano-robot (Avinash), his colleague (Manas) are very positive about it. They have an internal advisor Vivek who tells them what is right and what is wrong. But they do not listen and their product fails and the company is facing a huge crisis. At such a time Vivek brings a consultant to bail them out – Mr Gyan Prakash. Mr Gyan Prakash gives them a solution and explains to them the entire concept of desire and the theme of selfless service is revealed. Aninash and Manas want to know if there is any place where we can see technology being used selflessly. The sets used in the drama were simple, but detailed and expressive. Though prepared at the last minute - as the boys were also busy making the hundred odd arrangements for the Conference as well as taking care of the needs of the guests and keeping up with their studies as well as making the time to practise - the 100 boys who participated in the making of the drama pulled it all off without a hitch or hiccup, just like everything else where the grace of God is obtained! The Music College boys after a hiatus put up a very creditable programme this evening called “RAMA NAMAMRUTHAM” – The Nectarine name of Lord Rama. Three boys of the Music College (Sri S. Harish, Sri K.R. Gokul and Sri Roopesh Chandran - all pursuing their Diploma Course in Music) sang the first part of the concert - a vocal recital. The first song was Namo Namo Raghavaya Anisham in raag Deshiya Thodi set to Rupaki Thalam. This is a divya nama sankirtana in Sanskrit which is in praise of Lord Rama. This composition is considered as the first composition of Thyagaraja Swami. 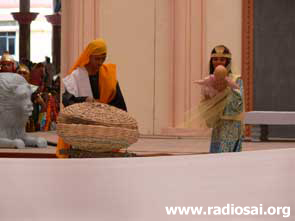 The next song was a long one – NAMA RAMAYANAM, which depicts the whole Ramayanam divided into 7 kaandams or sections. The first is Bala kaandam, which is in raag Yamuna Kalyani and starting with “Suddha Brahma Parathpara Ram, Kaalath Maka Parameshwar Ram”. The next is Ayodhya kaandam in raag Durbari Kanada followed by Aaranya kaandam in raag Valachi. Following this was Kishkindha kaandam in raag Hamsanadam, Sundara kaandam in raag Desh, Yuddha kaandam in raag Madhyamavathy, and finally Utthara kaandam in raag Kaapi. 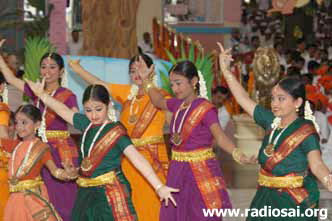 Each kaandam ends with the chorus “Ram Ram Jaya Raja Ram, Ram Ram Jaya Seetha Ram” in the respective ragas. The third song was another divya Nama sankirthana (divine song extolling the Lord’s name) composed by Thyagaraja Swami in Aananda Bhairavi set to Adi thalam. This song in praise of Lord Sri Rama in Telugu starts with “Rama Rama Neevaramu Kaava Rama Seetha Rama, Sadhu Jana Prema Ra Ra Rama”. The fourth song is also in Telugu, which is in raag Attana, set to Aadi thalam and starting with “Ra Ra Raghu Veera Venta Ra Ra”. This song is also in praise of Lord Rama and composed by Sri Thyagaraja. The fifth song was a thillana (thillana refers to a certain set of phrases like Nadiri diri dhim than na na) rendered by Sri S. Harish, a diploma student of Carnatic Vocal Music. The song is “Nadiri diri dhim than na na” in raag Kathanakuthuhalam. This was followed by “Entharo Mahanu Bhavalu”, one of the five pancharathnas of Sri Thyagaraja, set in Sri ragam. The RAMA NAMAMRUTHAM concert ended with a short piece in raag Kurinchi set to Adi thalam. 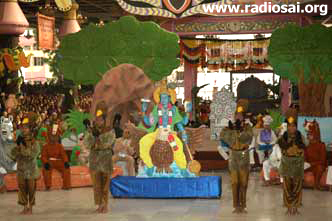 The song is “Bruhi Mukunde dhi rasane” in Sanskrit, a song in praise of Sri Krishna. 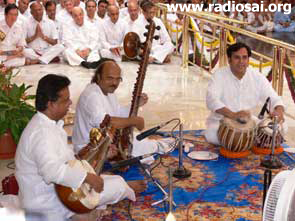 The 3 singers were accompanied on the mridangam and kol by Kishore Shastry, on the tabla by Sri Mayur Mudaliyar and on the harmonium by Roopesh Chandran and Bhaskar. 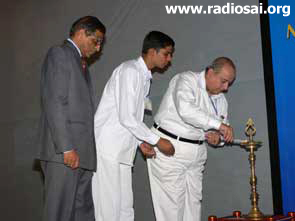 Talam was provided by Sri R. Harish. The vocal concert was followed by a sitar programme by Sri Soorya Narayana Murthy of the Sri Sathya Sai Mirpuri College of Music. He played his own composition first – a short alap (a slow elaboration of the ragam) in raag Vrindabani Sarang set to ek taal. The second piece was in raag Durga set to teen taal followed by 2 bhajans played on this instrument – Ganga Gadha Dhara Gauri Shankara and Sri Guru Parthi Vasa. 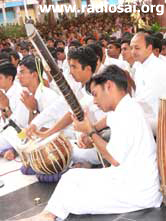 He was accompanied by Sri Abhisekh Narayana Acharya on the tabla. At the end of the concert, Swami was so pleased with the student’s dedication to his art as reflected in his mastery over the sitar, that he called the student over, manifested a gold chain for him and with His own hands put it around his neck. 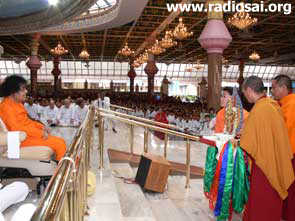 About 250 devotees from Japan (180 ladies and 70 gents) were in Puttaparthi for a few days. The group was brimming with suppressed excitement for they had a story to relate to the Lord. A story about how from Vijayadasami day onwards in the year 2004, the devotees in Japan had the extreme good fortune of studying the Vedas. They had prepared to tell this story in the form of a short skit and were also looking forward to chant and show their new found knowledge at the feet of the Veda Purusha Himself. And in a few days they got their chance on the evening of July 20 th. After Swami was seated in His chair, a Japanese lady in the traditional kimono welcomed Him with a rose and then gave Him a small brochure outlining the programme they had planned for Him this evening. 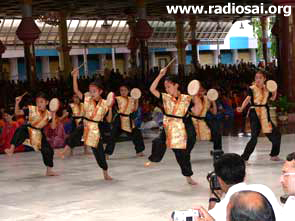 The programme started with a dance prepared by the Bala Vikas children. The dance programme entitled EISA is a dance from the Southern island of Japan called Okinawa. 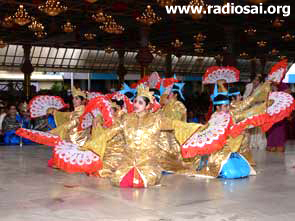 This traditional dance, which has been passed down from generation to generation, invokes the spirit of the ancestors and prays for the good health of the people and the eternal prosperity of society. 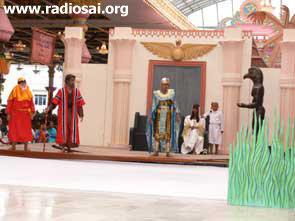 Through this dance, it is believed, the performers as well as the audience connect the co-existence of Man with God and Nature. The smart children dressed in traditional attire put up a very creditable, well rehearsed and choreographed item to the absolute delight of the crowd. Their martial-art style yells, keeping time in military precision movements and meaningful gestures and dance steps won the hearts of all. And in true Japanese style at the end, they all bowed in unison - first to the Lord and then turning back bowed to the entire congregation and then they turned back again and bowed to the Lord once more to signal the end of the dance. And at the end of the entire programme, after the crowd had left, I noticed that now in true Indian style the Bala Vikas kids touched the feet of the “gurus” who had taught them the dance steps with great reverence in a small informal ceremony. After this brief but entertaining dance, the Japanese presented their short skit entitled “Vedas, the Breath of Truth; Vedas, the Breath of Sathya” to tell the audience the true story of how the Vedas came to Japan. 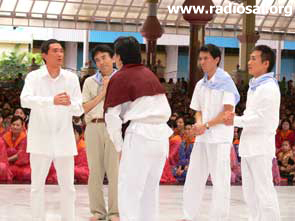 The Vedas were taught to them by the alumni of the Sri Sathya Sai Institute of Higher Learning who currently live and work in Japan. 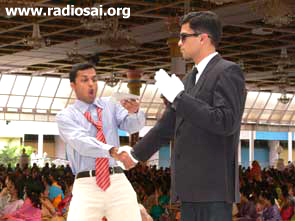 The skit starts with a Japanese devotee praying ardently to Swami to give him a chance to learn the Vedas. He bemoans the fact that being Japanese, he neither knows English nor Sanskrit, yet he prays that his entire soul is captured by the Vedas. He prays, “Baba, O Baba! I wish to recite that language of the Gods with my own tongue. I want my whole body and heart to vibrate in the sound of truth”. In the next scene three students of the SSSIHL are just about to graduate and are grief stricken at the thought of having to leave the Divine presence. 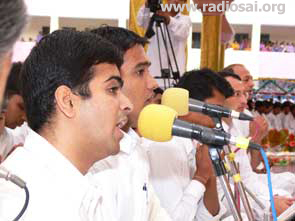 Prashanth says that Swami wants us to serve in society and be a good example to others. Prem concurs but still avers that his heart is bound with Swami and it is painful to separate from Him. The third student, Anand says, “In this kind of separation there is no separation at all, but rather a precious experience welcomed with joy and determination. It is the beginning of a great adventure filled with sacred surprise and the supreme pleasure of going along with God”. Anand further adds that he is going to a Japanese University for further study and research. 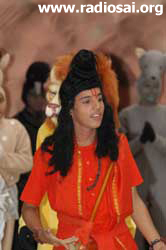 The next scene shifts to show Anand in Japan – missing Swami very much. 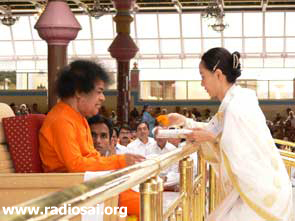 He visits the Sathya Sai Osaka Centre for worship, where the time spent with Sai’s devotees revives his enthusiasm. 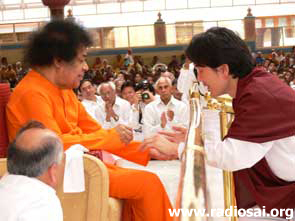 One day the Japanese devotee, who had in the opening scene prayed to Swami, talks to Anand and earnestly requests him to teach the Japanese the Vedas. Anand is at first very hesitant as he does not feel competent or qualified enough to accomplish this sacred task. 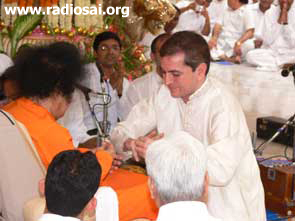 After many devotees appeal to him, Anand finally relents and agrees to do his best. "Anand will you teach the Vedas in Osaka"
In the next scene another Sai student Prashanth comes to Tokyo for a collaborative research between his company in India and a Japanese company. Feeling lonely, Prashanth locates Anand, who invites him to a sadhana camp in Osaka and they are happy to be with their Japanese Sai family. A devotee from Tokyo requests Prashanth to teach the Vedas in Tokyo also. 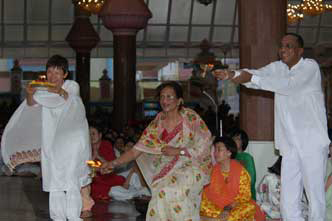 Seeing the aspiration of the devotees in Tokyo, Prashanth decides to undertake this Sai mission as an instrument of Sai. One day Anand visits Fukuoka, a major city in the South-West of Japan, to attend a Veda conference when he receives a call to his cell phone from Prem, who informs him that he has left India and now (very coincidentally) he is in Fukuoka. The 2 friends are overjoyed and they go the Sai Centre in Fukuoka. 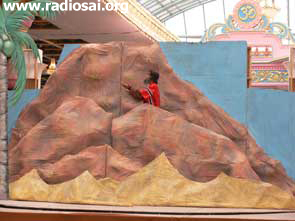 The skit narrated that these sequences of “coincidences” of three of Sai’s students coming to Japan at the same time (one to Osaka, one to Tokyo and the third to Fukuoka) is verily Sai’s answer to a pure prayer for learning the Vedas. Finally the entire class chants the Vedas for Swami’s benefit. 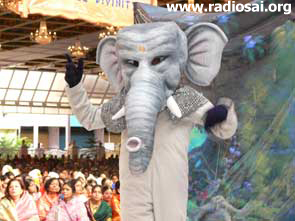 They recite the Ganapathi Prarthana, followed by the Manthra Pushpam and the Narayana Upanishad. While the Veda chanting by the entire Japanese congregation was going on, Swami asks two current students - one from Lithuania (which was formerly a part of the Soviet Union) and the other from the United States of America to come up and stand in front of Him and recite the Vedas also. It was an uncommonly precious scene. The Japanese chanting the Vedas sitting in front of Swami; the two students from the USA and Lithuania united as brothers in Sai’s love; and the entire student fraternity from the primary school kids to the post graduate students all chanting the Vedas in unison - with Swami beaming in happiness. Yes, His Mission is really well underway! The Golden Age of Sai is here and the age is now! But their programme was not over yet. 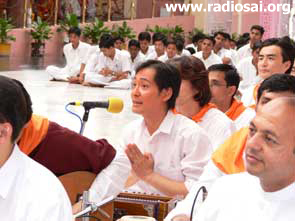 In 1999, when the Japanese had sung at the Buddha Poornima festival, Swami had told them, “Practise hard. Practise more and more. Practise will make you much, much better”. 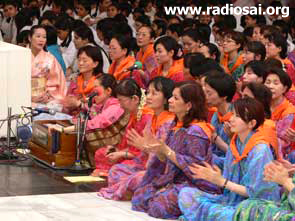 Ever since then intense practise was emphasized in Japan for all the Japanese bhajans they were singing. Set to Japanese melody lines, these bhajans express God’s beauty, and their thoughts of God and heart-felt gratitude to Him. So the entire Japanese group next joyously sang Swami’s glory expressed in the beauty of the Japanese language. Starting with Gajanana Om gajanana (2x) Warera wo michibiku Seinary Chikara yo…, they followed it with Jaya Guru jaya Guru Jaya Guru Sai Ram, Nanak Iesu Buddha Zorashtra, Subete no Guru wa Ai no guru…. The next bhajan was Kami no Ai no Nakade Ikiru Yorokobi, Osore mo Urei mo naku Mikokoro no Mama ni and the last one was Arigatou Swami Arigatou Swami Kokoro no naka ni owasu Kami. At this point Swami left the dais to go the interview room as the governor of one of the states of India was waiting for an audience with Him. 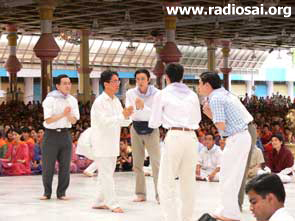 Before he left, however, Swami asked the Japanese group to continue singing the bhajans. And they sang with gusto for the next 20 minutes or so, till Swami returned and arathi was taken for the day. 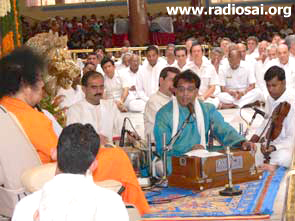 The Brindavan Bhajan Group presented a musical ensemble called “Geetha Mallika” comprising of devotional songs in Hindi, Sanskrit, Kannada and the Telugu languages, on the evening of Sunday, 23rd July 2006, in the Divine Presence of Bhagavan. This was a repeat (with a couple of songs added) of the programme presented by the group in Brindavan in May (and reported in our June 1st Issue). 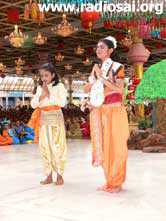 At that time Bhagavan had commanded them to come and perform it again in Prashanti Nilayam. It was in direct response to this divine command that the gents of the Brindavan Bhajan Group had assembled in Sai Kulwant Hall on this day. 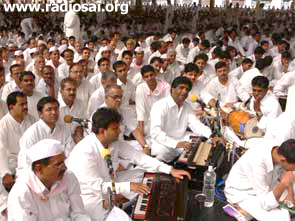 The Brindavan Bhajan Group is quite unique in more ways than one. The group consists of individuals with different, educational and professional skills and age group, including alumni from Swami’s Institutions. All of them despite their busy occupational constraints take the time to practise songs regularly. The songs presented by them were the result of more than a year’s sustained practise. Swami signalled the programme to start after the co-ordinator of the group explained the contents of the programme to Him. As the song presentation were in different languages, ragas, swaras, and rhythm, it all added variety and melody to the rendition. A short explanation mentioning the gist of the song was read out before each song. After the presentation, Swami gestured to one of the singers to sing the song “Tavakaram Amrutham..” for a second time and was in bliss enjoying the Sindhu bhairavi song describing the sweetness of Bhagavan’s darshan, sparshan and sambhashan. 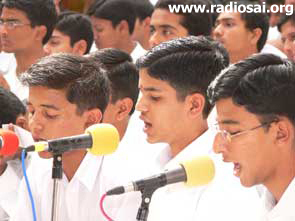 At the conclusion of their prepared programme, Bhagavan asked the students to sing some devotional songs. At the conclusion Swami graciously agreed for a group photograph, and also permitted them to take padanamaskar individually. 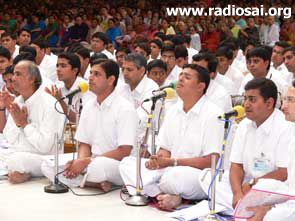 The Group singers pleaded with Bhagavan to talk to all of them separately. To divert the attention from their pleading, Swami jokingly asked all to look at the camera for the group shot. He also asked one of the photographers to yell ‘Ready’ and then click and thus “succeeded” in diverting everyone’s attention much to the joy and happiness of the participants as well as the devotees at this divine leela. The evening concluded with arati and distribution of prasadam. And on this note we also conclude this month’s chronicles. There have been a lot of programmes squeezed into a few days, but nevertheless it has been an engaging month. 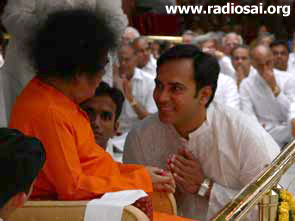 On the days when there were no programmes, Swami would either be busy granting interviews to the numerous devotees or groups from around the world that had come to Prashanti Nilayam for Guru Poornima. He would also occasionally sit outside in the evening and listen attentively to the sonorous chants of the Vedas. But what distinguished this month also is the number of letters that He has taken, from the doctors when He gets down from the car or on occasions from devotees and from the students when He is sitting on the veranda. Sometimes He would take letters from as many as 25 students one after the other. And all of them would give Him their letters, ask His precious advice, and then with His permission take the coveted padanamaskar. The month of August also promises to be a busy one. 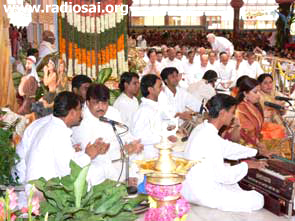 There is the Vara Lakshmi Puja followed by the Ati Rudra Maha Yagnam planned for 12 days from the 9th to the 20th of August, 2006, performed for the peace and prosperity of humanity. 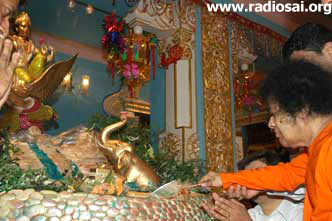 Additionally there are the festivals of Krishna Janmastami and Ganesh Chathurthi that also falls in this month. So till next time we wish you the best in all your endeavours.